North Queensland independent federal MP Bob Katter today launched a new party – as well as a broadside against the powerful supermarket duopoly in Australia. Mr Katter said he wanted laws that no one company can control more than 22 percent of Australia’s grocery market – compared with the 85 percent he says is controlled by Coles and Woolworths. “We will bust up the Coles Woolworth’s duopoly,” he said. 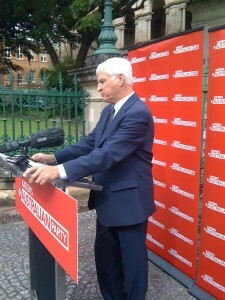 Mr Katter today launched his new “Australian Party” outside the gates of the Queensland Parliament buildings he occupied as a National Party minister in the 1980s. The party is seeking candidates to run in the Queensland election to be held next year. Other Australian Party policies include opposition to the federal Labor government’s proposed carbon tax and to the Queensland Labor government’s sale of power stations and other assets. The party also opposes “nanny state” restrictions on people’s freedoms to engage in recreational pursuits such as fishing, hunting and 4-wheel driving. As to whether some of his policies seemed Marxist he said: “I believe in free trade, but no other country in the world does. He invoked the name of Theodore Roosevelt as “the trust buster” who campaigned a century ago for the breaking up of several very powerful business monopolies that were killing off small business competitors in the United States – including the powerful Standard Oil. Would he solicit the help of fellow independents in federal parliament to break up the duopoly? Mr Katter said that would require the support of either the Labor or Liberal parties, both whom were committed to laissez faire economic policies. The president of the new party, south Queensland farmer Rowell Walton, introduced Mr Katter at the launch as a farmer who raises “beef and wheat” as well as being a director of the Australian Beef Association. Asked later about mistreatment of live exported cattle in Indonesia he said he was, like all farmers very upset. He said farmers had little power but wanted to end the cruelty. Premier Anna Bligh said creation of the new party would make for a “very interesting” forthcoming election, while LNP leader Campbell Newman said people supporting independents would help re-election of the Labor government. The Australian Party’s policies and principles are on their website at: www.ausparty.org.au. I agree with Bob – duopoly isn’t free trade. I came to Brisbane, from Melbourne, and expected the fruit to be falling from the trees. Mangoes do grow here in sunny Queensland, don’t they? Protectionism is simply bad economic policy. All it does it delays the inevitable. Industries must adapt or die.